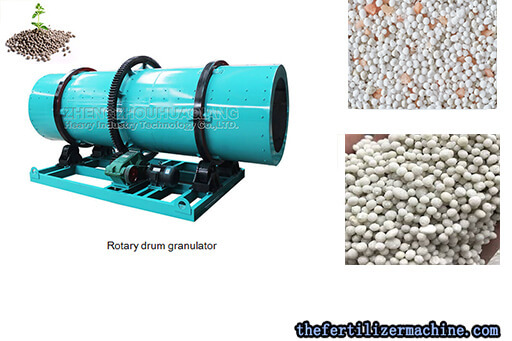 Rotary drum granulation production line is widely used in compound fertilizer production. We provide the customized the high-quality and high-output 80,000 Tons Per Year-Customized Rotary Drum Granulation Production Line Manufactured In Zhengzhou Tianci is the professional compound fertilizer production line, it can provide the capacity is 5000 tons, 30,000 tons, 80,000tons of NPK compound fertilizer production line-rotary drum granulation production line accordng to our clients' needs. the whole production line incleduing: the chain crusher, fertilizer vertical mixer, rotary drum granulator, rotary dryer, rotary cooler, polishing machine, rotary screener, dust collector, hot stoove, fertilizer automatic packing machine, all of them can meet the demand of high yields and environmental-protection compound fertilizer production. Its granulation production process is to send each basic fertilizer raw material into its own storage hopper, according to the requirements of formula proportions, through the computer-controlled metering and conveying equipment, and sent into the raw material crushing or secondary remixing or storage hopper, each basic fertilizer, fine material and crushed coarse granules are returned to the granulation equipment through belts for granulation. The new blended raw materials are fed into drum granulator at a uniform rate according to the balling rate. At the same time, the saturated steam is fed into the material layer as required, so that the granulation process can be granulated at a lower moisture content, which not only raises the temperature of the material, but also causes the material to be humidified, thereby reducing the drying load. But, it needs to depend on the granulation rate, if necessary, a small amount of water or fertilizer solution may be sprayed on the material to maintain the optimum liquid phase for the granulation of the material. Chain crusher is applied to the shattering of the block in the production of organic fertilizer. This machine use high-intensity wear resisting and cemented carbide chain plate with synchronous speed, and it has reasonable design for entrance and out quarrel, so which results in such advantages: fully broken, difficult to stick wall, easy to clean. 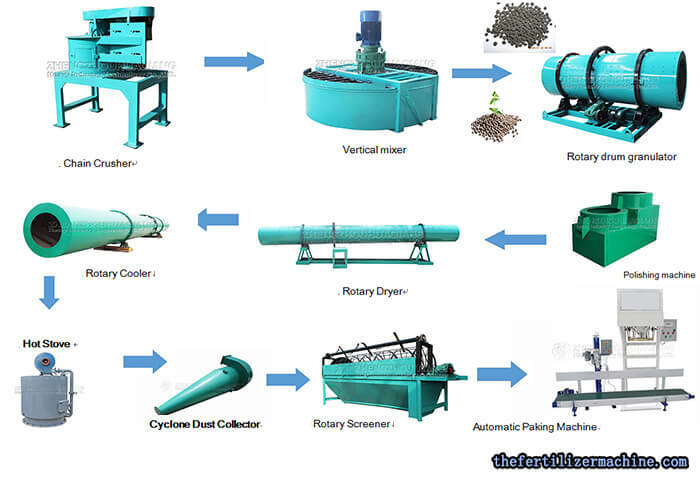 Fertilizer Drying Machine is mainly used to dry a certain temperature and granularity of fertilizer. On the other hand, it also can be used for drying other materials in compound fertilizer processing plant and organic fertilizer produciton plant. The Angle and distribution of Jan plate of this machine is designed reasonable, and it is reliable in performance. Ii has high thermal efficiency, uniform drying, cleaning fewer materials, convenient use and maintenance. Use dryer together can greatly improve the cooling rate, reduce labor intensity and improve the quality, further remove moisture, reduce the grain temperature of fertilizer. Rotary Screener is mainly used for separating finished products and return materials, but also to achieve the product classification, the finished product evenly classified, the machine uses a combined screen, easy maintenance and Replacement, its simple structure, convenient operation, stable running. Dust collector is a type of dust removal device. Each component of the dust collector has a certain size ratio. Each change in the proportional relationship can affect the efficiency and pressure loss of the dust collector. The diameter of the dust collector, the size of the air inlet, and the diameter of the exhaust pipe are the main influencing factors. When using it, it should be noted that when a certain limit is exceeded, favorable factors can also be turned into adverse factors. In addition, some factors are beneficial to improve the dust removal efficiency, but it will increase the pressure loss, so the adjustment of all factors must be taken into account. This machine is a new type of equipment: the granulating rate is more than 95%. The motor adopts flexible belt drive to start smooth, slow down the impact force and improve the service life of the equipment. Through the process, the discs are hard and durable, it is never deformed and sturdy base. It does not need foot bolt fixed. It also has the long service life and so on, it is deeply used. High praise of the household is the ideal product for the majority of users. it is not only used for 80,000 Tons NPKCompound Fertilizer Production- Rotary Drum Granulation Production Line Annual Output, but also can used in the organic fertilizer production line. Automatic quantitative packaging of powdery materials, with the advantages of high precision weighing controller, good reliability. Good integrity, small floor area, flexible and convenient installation. And the feeding mode of the powder feeding equipment is a spiral feeding, fast and slow feeding through the controller to achieve, feeding speed can be arbitrarily set. Environmental protection operation: Closed inner circulation system, effectively prevent dust from flying, improve the working environment, and protect the health of employees. The structure is compact, the volume is small, and can be made into a fixed or mobile body according to the requirement of the user. 1.The balling rate reaches 70%, there is a small amount of return material, at the same time, the return material size is small, and it can be re-granulated. 2. Using the steam heating, to raise the temperature of the material, that makes the material low in moisture after balling, and improve the drying efficiency. 3. Using the rubber engineering plastic as the lining, raw materials are not easy to stick the tube, and play a role in anti-corrosion insulation. 4. It has the larger output, the less power consumption, and the lower maintenance. We will provide the customized service with professional and high-quality thchnology for you according to our clients’ requirements with design, manufacturing process, installation guidance, excellent after-sales services. Fertilizer production equipment plays the important role in the organic planting and breeding, it can process the animal manure, into the organic fertilizers, not only solve the problems of organic raw materials sources, but also improve our environment and get the additional income.